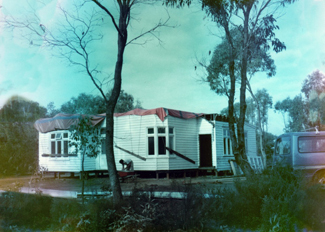 Lot 7, comprising 6 acres 19 perches, was first purchased by John & Robyn Cox in 1978. 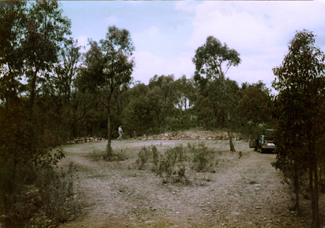 It, along with other lots, had the usual Bushlands’ package; a road in and a driveway (Lot 7 being at the end of what is now called Wattle Road); a good dam; a house site and a couple of truckloads of rock for potential building projects. My family and I purchased the block from the Coxes, in December 1983, for $7000. Max Cassidy Snr. (dec.) was the estate agent who sold the block to us. With his undoubted skills in assessing his clientele and the influence of the Earl Grey tea bags from his filing cabinet, it was a sure sale right from the start! After considering many options, Max delivered a clear statement: “We are now going to see your block!” We did not take too much convincing; Lot 7 turned out to be such a beautiful setting. However, the dam wall had been lucky to survive. Consolidation over time had seen the centre of the wall sink below the level of the overflow run, and there was a significant wash-away at the back of the wall where the onset of some very heavy rain had resulted in water crossing the top of the wall. The whole structure was threatened. Levelling of the wall became an immediate priority and was even implemented before the sale was finalised. not allow passage for such a large cargo. One person sat atop the house, with chainsaw in hand, to trim a few branches along the route. possibilities were always in the offering. 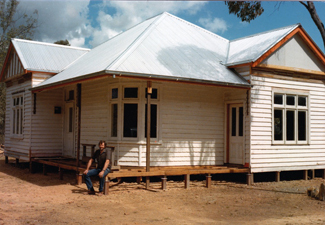 After the major work on the house was completed a mud brick carport and shed and a timber workshop were added. Among the many difficulties that I encountered in acquiring an edifice that was constructed early in the twentieth Century, was that I also acquired some unwanted baggage. This took the form of the ghost of Harry R. Harry R lived in the house many years ago and routinely left the house each work day morning and routinely returned each work day evening. And then one day he didn’t any more. Subsequent residents were frequently disturbed by his rumbling about the house at night. I can only guess that he chose to stay with the house when it was moved and his presence was very much evident in the frequency with which my tools, especially my hammer, were hidden. It was not very amusing to spend ages looking for a tool, which had just been used, when only Harry and I were on site! Lot 7 was the weekender for my immediate family for many years, sometimes frequently occupied and sometimes not. In more recent years the next generation, that of grandchildren, have become part of the regular visitor contingent to the block. 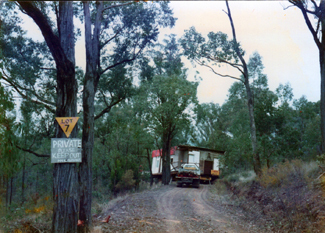 I took up permanent residence in the Bushlands in 2001 after selling my city abode. In early days, the mid 1980s, lighting was provided by gas lamps and some makeshift wiring connected to the Honda powered 2 KVA petrol generator which was the source of electrical power for many years. A petrol fuelled pump was used to both pump water from the dam to a header tank, well up the hill, and rain water for household use to another header tank. That pump is still in use twenty seven years later for dam water but since solar power was installed, the rain water now makes its journey via an electric water pump. Early in our occupancy, the electrical wiring that was already in the house was upgraded and I also installed nine interior gas lights. These provided light and atmosphere and allowed us to turn off the noisy generator at night. 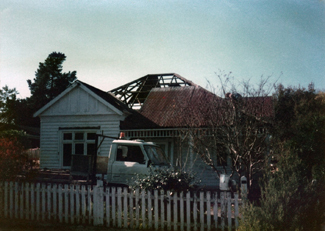 All this was superseded, when I moved in permanently, with solar panels, a 24Volt battery storage system and a back-up 5.5 KVA diesel generator – a relatively quiet one. 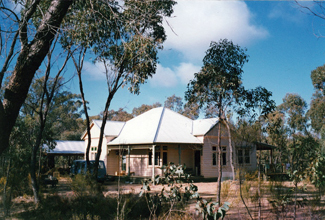 Always, the appeal of the Bushlands has been the relatively unspoiled nature of this spasmodically occupied area and the joy of being in a bush retreat, escaping the hustle and bustle of city life. We looked forward to our visits to a diverse and accepting community, being comfortable in the knowledge that neighbours would be keeping an eye on the property when we were not around. There is much to enjoy in sitting on the verandah, at almost any time of day, taking in the beauty of the bush and noting its changes season to season and over time. It is always a thrill to see the kangaroos bounding by to gather and graze in the valley below, along with listening to the many birds and watching their antics. We enjoy the glorious sunsets and the shafts of golden light that tinge the foliage of the eucalypts as the sun descends beyond the hills. Dusk can also provide the spectacle of the resident sugar gliders creeping out from the house ceiling onto the roof and making their amazing leaps from tree to tree, although their noisy return early in the morning is not always appreciated. The Chewton Bushlands is a great place to be! This entry was posted	on Thursday, November 15th, 2012 at 12:38 pm	and filed under • Bushlanders, Our lot. You can follow any responses to this entry through the RSS 2.0 feed.